Unlike most other generating technologies, wind turbines are often located in rural areas, where background noise levels can be very low, especially overnight. In fact the critical times are when wind speed is at the lower end of the turbine operating range, because then the wind-induced background noise is lowest, so the turbines can be heard more clearly. The main noise sources (blade tips, the trailing edge of the outer part of the blade, the gearbox and generator) are elevated, and so are not screened by topography or obstacles. Turbine manufacturers may provide noise characteristic certificates, based on measurements by independent test organisations to agreed standards. The internationally recognised standard that is typically referred to is 'Wind turbine generator systems: Acoustic noise measurement techniques' (IEC 61400 Part 11 of 2002). Standard techniques, taking into account standard noise propagation models, are used to calculate the expected noise levels at critical locations, which are usually the nearest dwellings. The results are then compared with the acceptable levels, which are often defined in national legislation. An example of a “noise map” that can be generated by a WFDT is shown in Figure I.4.6. 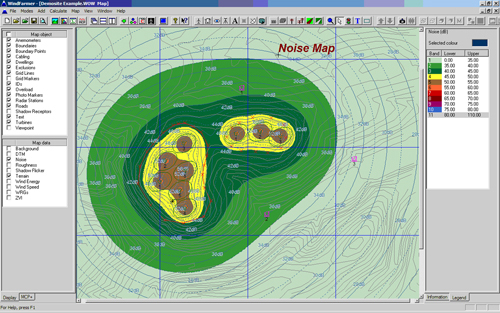 The noise contours shown represent the modeled noise at any point in the vicinity of the wind farm. The internationally recognized standard for such calculations is 'Acoustics — Attenuation of sound during propagation outdoors — Part 2: General method of calculation' (ISO 9613-2). Sometimes the permitting authorities will require the project to conform to noise limits, with penalties if it can be shown that the project does not comply. In turn the turbine manufacturer could provide a warranty for the noise produced by the turbines. The warranty may be backed up by agreed measurement techniques in case it is necessary to undertake noise tests on one or more turbines.